With a family history of arthritis and bad knees, plus more than 40 years of high-impact sports (basketball, volleyball and soccer), I should not have been surprised when my doctor suggested I would be returning to him anywhere from a year to 10 years for a knee replacement. The conversation occurred in 2005 after I injured my left knee in a soccer match, resulting in arthroscopic surgery to repair the meniscus. In a follow-up visit after the surgery, the doctor said my knee should be fine for another 10 years … but only if I stopped running and cut back on the amount of soccer I was playing at the time. If not, he said, I should just go ahead and schedule the knee replacement soon. Therefore, I took the doc’s advice, giving up running altogether and limiting soccer to one game a week. Nothing more. He was right: Everything was good, and I kept playing well into my 50s. 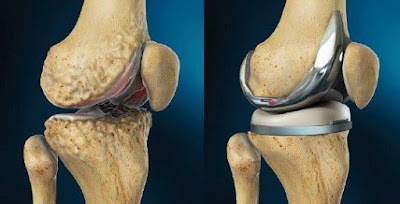 However, about eight years after the surgery on the left knee, my right knee failed altogether and it was time for a total knee replacement. That was two years ago; and just two months ago, I returned for a right knee replacement. My goal is to share my experiences in order that anyone else making the decision to get a new knee can be as informed and prepared as possible. Consider this the alternative to this article, 9 Things No One Ever Tells You about Getting a Knee Replacement. When should you begin considering a knee replacement? The best answer is to consult with your doctor. Although you might hear people saying, “I should have done this sooner,” the right answer is unique to each person and each knee. When I asked my doctor, he said, “You will know when the time is right.” With the right knee, over several years I went from pain relievers and physical therapy, to cortisone shots, to almost unbearable pain before agreeing to the surgery. Two years later, I didn’t wait for the pain to get too severe. Instead, the prompt for the surgery came as I tried to traverse my daughter’s hilly college campus on her first visit, discovering I could not easily go up and down the many earthen stairs, or the stairs in the buildings. I also could not keep pace with other members of the tour groups and was the only parent who waited for an elevator. I believe this depends on your pain threshold as well as knowing that each surgery is different. As with any surgery, there will be pain as your knee is cut open and a replacement part is installed. It takes time for the wound to heal, the swelling to subside and the need for the use of painkillers to go away. With my first surgery, I used a walker for two week, then a cane for another month. I was dependent on (not addicted to) to strong painkillers for a few weeks, then got my non-narcotic painkillers refilled about four times. I recall the pain being severe whenever the medicine wore off, with nights being most troublesome. It was much different the second time. I ditched the walker almost immediately – just a few days after getting home. In addition, I didn’t use the cane too much, only for the long walks from the parking garage to my office. I did not need any narcotic painkillers, and I only had two refills of the mild medicine. My pain level was almost nonexistent, although it was still uncomfortable to sleep. Although the knee will swell after the surgery, and can take anywhere from three months to a year to return to normal, isn’t so much about pain as it is about limited flexibility. With both of my surgeries, I scheduled in-home physical therapy, five days a week for two weeks. This PT was all about regaining my range of motion. The PT, plus regular icing, had me bending my knee enough to put on my socks and pants by myself a week after the second surgery. This was much different from my first surgery where it took about three weeks to do these routine tasks. Following both surgeries, I was back at work after a few weeks. As for driving, I could do that after two weeks when it was my left leg. However, I needed to get a ride to the office for about a month following the right knee replacement, as this is the driving leg. What about therapy – how much does it hurt? Following the two weeks of in-home PT, I have been doing outpatient therapy twice a week for a couple of months. Don’t be scared by people saying therapists are masochists or the pain is excruciating. Both are false. Almost all of my physical therapy has involved range of motion, strengthening my core, quads and glutes, and strengthening the new knee. The therapist designs the program, teaches you the right techniques and times your intervals. Any pain is completely self-inflicted, as my routines never involved the PT’s hands on my body. Massaging of the affected knee to combat the scar tissue and inflammation are the only times that I’m touched by the therapist. ICE WRAP: Invest in some type of Velcro cold therapy knee wrap. For less than $20, this makes it super easy to ice your knee on a regular basis. TRANSPORTATION: If it’s your right knee, find a friend or co-worker who can take you to and from your work location. Plan on needing their help for about four weeks. SHOES: Shoes can make the difference. On my third outpatient visit after my first surgery, my therapist looked at my aging Nikes and noted they were not conducive to a good recovery. “You need new shoes,” she commanded. “These have formed to your old knee and will keep you from progressing.” I went straight to the New Balance store and was fitted for a new pair. The most frequent response I get when asked about my new knee is, “So, you’ll be running a marathon soon, right?” Nope. I did not run long distances before and I’m not going to begin now. Nor am I going to be playing soccer again. These were not the goals. Instead, I’m glad to be pain free in the right knee and on the way to the same with the left. I’m counting on resuming my 2-mile morning walk (I’m halfway there today) and maybe even coaching a youth soccer team again. Finally, I look forward to visiting my daughter at college and navigating that hilly Samford campus with youthful vigor.